Jan Ebeling and Bellenna. ©SusanStickle.com. Wellington, FL – February 24, 2019 – Competition on Sunday, February 24, at the Adequan® Global Dressage Festival (AGDF) featured freestyle classes from the Young Rider level to Intermediate I. Jan Ebeling (USA) and Bellenna had the last test of the day and rode to a win in the FEI Intermediate I Freestyle CDI3* presented by the Wellington Regional Medical Center. Ebeling and Bellenna, a nine-year-old Hanoverian gelding by Belissimo M owned by Ann Romney, earned a score of 76.500% with their freestyle designed by Karen Robinson. “First of all, it’s a very green horse so we’re keeping the lines fairly simple,” said Ebeling of his partner Bellenna. “The horse has fantastic basic gaits; the walk, extended walk, collected walk are really great. Those are always places where she can score high. Ebeling found places to simplify the test for his green mount. He said, “I think the most difficult thing is the half pass to a pirouette to a half pass, and I simplified that a little bit. I had a little bit of a cheater line in there, [it was a] half pass, and then I went straight a little ways, and then pirouette. I kind of put it into a few pieces instead of putting it all together. “It’s fun, I’m lucky to have the horses that I have and the sponsorship behind me. It takes a horse, and it takes a rider, but it takes a village to really make it happen,” concluded Ebeling. Second place went to Classy Sinclair, a 12-year-old Oldenburg gelding by Sir Sinclair x Sacro Santa owned by Lisa Grossi and ridden by Leif Aho (USA), who scored 74.458%. Ariana Chia (CAN) and her own Fiderflame, a nine-year-old Oldenburg gelding by Fidertanz x SPS Rose, placed third with a score of 73.417%. Jan Ebeling and Sergio Leone. Photo Credit: ©SusanJStickle. Wellington, FL — March 4, 2018 — It was the final rider who triumphed on the final day in week eight of the 2018 Adequan® Global Dressage Festival (AGDF) at Palm Beach International Equestrian Center (PBIEC) in Wellington, Florida. The USA’s Jan Ebeling scored 71.958% — the only plus-70% score — to land the Intermediate I Freestyle CDI3*, presented by ProElite®. It was the second win of the week for Ann Romney’s 10-year-old gelding, his first having come in the Intermediate I CDI3* class. In the Prix St Georges CDI3*, this small tour series’ first contest, Canada’s Tom Dvorak pipped Ebeling to the post on Carla Bahr’s nine-year-old gelding Cyrus, but Ebeling pulled out all the stops in the freestyle on Sergio Leone to regain the top step of the podium. “He was awesome in there. He was ‘on’ in the I-1 already, and today he was even better,” said the German-born U.S. Olympian. “In the first test — the prix st georges — he’s always a little timid. Although he’s shown a lot, he’s always been like that in the first test. He’s a little tight and tense looking at the arena, but he was great today; super easy. Although only lightly shown in CDIs, Ebeling has been competing the Oldenburg gelding by Sir Donnerhall x Stedinger in national classes since he was five after sourcing him through Christian Heinrich in Bremen, Germany. In the pony division, 11-year-old Paige Hendrick recorded her second win of the week, topping the FEI Pony Freestyle on Otinio. Hendrick is the youngest American rider to gain the US Dressage Federation silver medal. Remarkably, she has already been out competing at prix st georges level. She is also the youngest rider to be selected for Robert Dover’s 2018 Christian Kennedy Future Stars Scholarship program. Otinio is a 20-year-old New Forest pony who is trained to grand prix level and can perform 17 one-time changes as well as piaffe and passage. The family made the trip down from their home in Rhode Island. Otinio is familiar with Florida as he competed at the AGDF numerous times between 2012 and 2015 under his previous rider, Asia Ondaatje Rupert (USA), and won most of the classes he contested. Hendrick and Otinio led the freestyle class with 66.575%, just 0.075% ahead of second-placed Scarlett Hansen (CAN) and Reve De Glatigny. Vanessa Creech-Terauds, daughter of Diane — scored a double, topping both the young rider freestyle, sponsored by Yeguada de Ymas, and the under-25 grand prix freestyle, presented by Diamante Farms. The Canadian rode Devon L, who was unbeaten in both his starts in week eight, to 67.8% at grand prix level, and Rob Roy, by Rubin Royal, to 70.9% in the young riders’ class. Both horses are owned by Leatherdale Farms. For more information and results, visit www.globaldressagefestival.com. 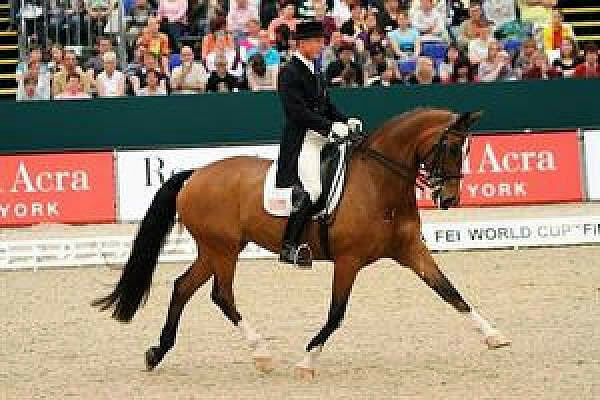 Lexington, Ky. – Jan Ebeling has withdrawn Beth Meyer, Ann Romney, and Amy Ebeling’s Rafalca from the CDI4* Aachen and contention for the 2014 Alltech FEI World Equestrian Games U.S. Dressage Team. Ebeling (Moorpark, Calif.) decided that the welfare of the 17-year-old Oldenburg mare was paramount and that it would be in the best interest of World Cup and 2012 Olympic Games veteran to retire from competition. The U.S. Dressage Team and Chef d’Equipe Robert Dover fully supports Ebeling in his decision to put Rafalca’s well-being above all else. 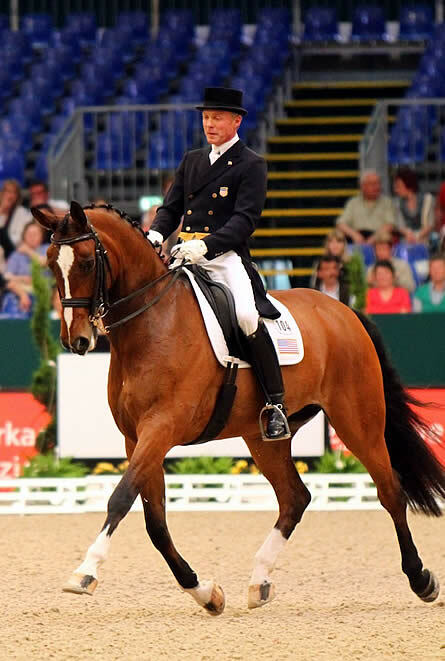 Members of the Short List for the 2014 Alltech FEI World Equestrian Games U.S. Dressage Team head to Aachen, Germany to compete in CDIO5* and CDI4* competition, July 16-20. Learn more about CHIO Aachen here. 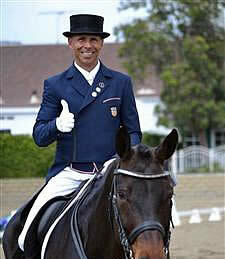 Follow the U.S. Dressage Team here. Greenwich, UK – Olympic Dressage got underway on Thursday in the main arena at Greenwich Park and the British put on an incredible display in front of an enthusiastic crowd. They had two riders to go in based on their draw and ended up taking the lead of the five teams who had two horses to compete on the first day. The United States drew sixth, meaning that only Jan Ebeling and Rafalca took to the arena on the first day for the U.S. Everyone is chasing the Brits who are trying to win their first ever Team Gold in dressage. They are led by Carl Hester, who had the highest score of the day on Uthopia. They scored 77.720%, just over a point higher than their teammate Laura Bechtolsheimer and Mistral Hojris. Ebeling (Moorpark, CA) led the way for Team USA in the Grand Prix scoring 70.243%, riding Ann Romney, Amy Ebeling, and Beth Meyers’ lovely 15-year-old Oldenburg mare Rafalca. The pair delivered on the expectation to set the mark for the team with a quality, consistent effort. The mare was generous and obedient and they produced a nearly clean test with just one small mistake in a pirouette. 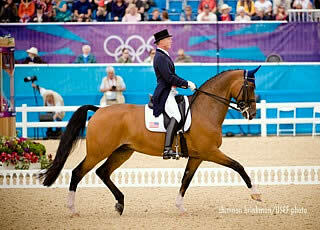 Greenwich Park, England – July 31, 2012 – The United States Equestrian Team Foundation is pleased to announce that the NBC Olympic Zone will be showing a special feature on U.S. Dressage competitors Jan Ebeling and Rafalca. The presentation will begin at 7:30 p.m. EDT and can be seen at http://www.nbcolympics.com. Ebeling and Rafalca will begin competing at the 2012 London Olympics in Greenwich Park on Thursday, August 2, 2012. The pair has recently shown the spotlight on Dressage while Rafalca’s co-owner Ann Romney’s husband Mitt makes a bid for the Presidency. 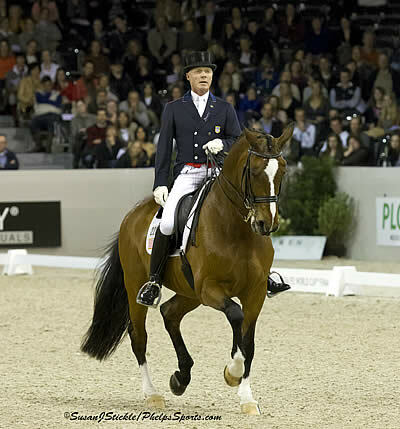 ‘s-Hertogenbosch, The Netherlands – The United States’ two representatives produced solid, fun Freestyle tests this afternoon at the Indoor Brabant in the final round of the Reem Acra FEI World Cup Dressage Final. Jan Ebeling and Shawna Harding utilized the lessons learned in Friday’s Grand Prix to produced better performances; both riders witnessed improved marks from the Grand Prix to the Freestyle. Ebeling (Moorpark, CA) put the mistakes of the previous day behind him and displayed an improved rhythm to score 69.875 for 15th place. Riding Amy Ebeling’s Oldenburg mare, Rafalca, Ebeling stayed perfectly in tune with the up-tempo music throughout his ride. The pair had a dramatic finish to their test with piaffe on the centerline and culminating with one-handed piaffe into the salute. A slight spook following the two-time changes performed on the rail was one of few mistakes in a pleasing effort. Lexington, KY – The United States Equestrian Federation (USEF) will be represented in four disciplines at CHIO Aachen, which runs July 8-17, 2011 in Aachen, Germany. Please click on any athlete or team name for more information about them. Catherine Haddad-Staller (Vectha, Germany) and Winyamaro have been named as the first ranked substitute. Jan Ebeling and Rafalca. Photo by Aly Sanderford/ Phelps Media Group. Leipzig, Germany – A strong field of 15 riders from nine nations contested Saturday evening’s Grand Prix Freestyle, to bring the Reem Acra FEI World Cup Dressage Final to a close. There were three nations that qualified three riders each for tonight’s class: the United States, The Netherlands and Germany. America’s Catherine Haddad-Staller, Shawna Harding and Jan Ebeling performed up-tempo freestyles in front of a large audience in Hall One of the Leipzig Exhibition Center. Haddad-Staller (Vechta, Germany) and her own Winyamaro started the evening’s competition with an impressive freestyle. The music selection played up the Hanoverian gelding’s expressive gaits and allowed for his character to shine through. Highlights of Haddad-Staller’s test included expressive lateral work and her one-handed canter extension. The pair rode to a score of 70.161% and finished the Grand Prix Freestyle in 12th place. Fellow American, Shawna Harding, followed Haddad-Staller into the ring with an equally fun ride, scoring 67.625%. Harding (Aiken, SC) and her own Come On III started their test with a high degree of difficulty by performing tempi-changes upon her entrance on the centerline. Come On III was more relaxed in his extended walk tonight than he was during Thursday’s Grand Prix test and had beautiful half-passes in both the trot and canter. This pair ended their test with an exclamation point by finishing completely in sync with their music. Harding and Come On III finished in 14th place. Leipzig, Germany – The Reem Acra FEI World Cup Final got underway Thursday evening with the grand prix presented by Sparkasse. The U.S. sent three combinations to the arena in Hall One of the Leipzig Exhibition Hall. The American horse/rider combinations did not disappoint in the field of 17. First in the arena for the U.S. were Jan Ebeling and Ann Romney’s Rafalca. This veteran pair demonstrated fluid trot work emphasized by a solid half-pass and had a consistent canter tour. Throughout the test, Rafalca was the picture of obedience and finished with a fluent centerline. The 52-year-old from Moorpark, CA, could not have been more proud of his longtime partner and found vindication tonight for a tense FEI World Cup Final debut in Las Vegas in 2009. Rafalca and Ebeling earned a score of 68.191% to finish the grand prix in 10th place. Burbank, CA – In sunny California, the competition for a coveted spot on the U.S. and Canadian Pan American Games teams heated up during the Festival of the Horse CDI-W/Y/J, held March 31 – April 3, 2011, at the Los Angeles Equestrian Center in Burbank. Despite a large and talented group of international competitors, there was no stopping Steffen Peters with what the judges deemed his new “super horse”, Weltino’s Magic.